The right time to cut back ornamental grass depends on the type of grass and whether the garden can benefit from the visual appeal of grass through the winter. Warm-season ornamental grasses are especially well-adapted to warm climates, and they grow most vigorously when temperatures are warmest in mid-summer. They usually begin to turn brown and go dormant as the weather cools in the fall, and they tend not to produce new growth until well into the spring when temperatures start to climb. Because of this growth cycle, warm-season grasses can be cut back either in the fall after they've gone dormant or in the early spring before new growth begins. Some ornamental grasses are attractive even in the winter, so you may want to leave the old growth in place until the spring. Examples of warm-season ornamental grasses include fountain grass (Pennisetum alopecuroides), which is hardy in U.S. Department of Agriculture plant hardiness zones 6 to 9, and plume grass (Erianthus ravennae), hardy in USDA zones 5 to 10. In contrast to warm-season grasses, cool-season grasses do most of their growing early in the spring and in the fall when temperatures are cool. Because their winter foliage is often attractive, the best time to cut them back is in the spring. Cool-season grasses tend to begin new growth significantly earlier than warm-season grasses do, however, so be sure to prune them very early in the spring before new shoots appear. 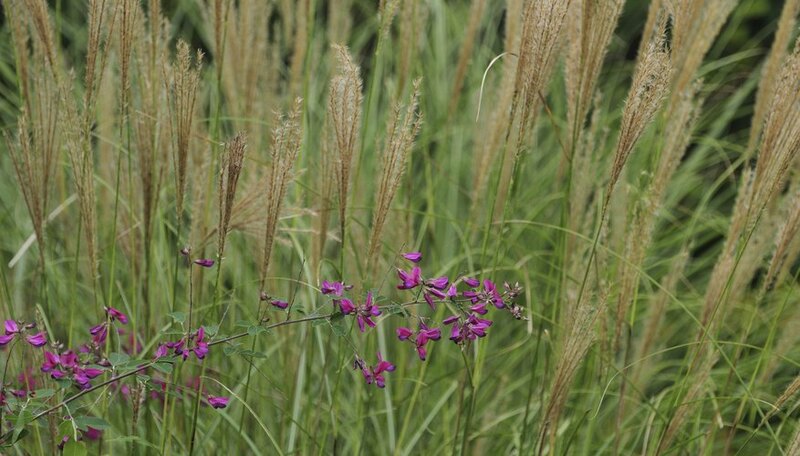 Examples of cool-season ornamental grasses include tufted hair grass (Deschampsia caespitosa) and silver spike grass (Spodiopogon sibiricus), both of which are hardy in USDA zones 4 to 9. Small, short clumps of grass can be cut back with pruning shears, but large clumps of tall grass species may require a string trimmer, a power hedge trimmer or even a chainsaw. Tie up large clumps into bundles before pruning so you'll have easy access to the base of the plant. Evergreen grasses don't go dormant like warm- and cool-season grasses, but they can be cut back by two-thirds every two to three years to rejuvenate the plants. When grasses are infected by pests such as the fungal infection commonly called rust, cutting the grass back may control the infection. Dispose of the pruned foliage and disinfect pruning tools between cuts to avoid spreading the infection.